Now, I have very dry skin in the winter and these did okay for me considering how dry I was. I found that it worked best if I did a light cover on my cheeks with foundation and put a bit more on the more oily parts in my t-zone. 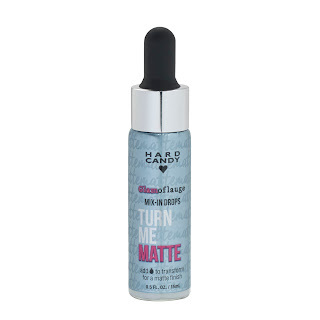 This kept me pretty matte looking all day. My foundation lasted too. I feel like oily girls will LOVE this because it might be a game changer in oil-control for you. 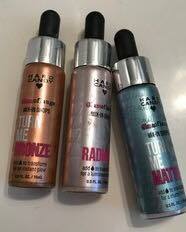 Hard Candy also sent me two other versions Turn Me Bronze and Turn Me Radiant. These were awesome too! The Radiant one gave me a nice subtle glow which just made me look healthier. It lightened my foundation a bit so it would be great to add to a color that might be a tad darker than you like too. The Bronze shade was pretty neat as well. This gave me some nice sunkissed color. I was worried about this one with me being so fair but it was just fine on my skin. It did darken my foundation a bit which would be perfect in the summer when colors tend to be too light when I get a little sun. These both looked great on my dry skin but I can see these working for all skin types. Overall I think these are some great products to have on hand. They all worked well and gave me some real options with my foundation. I really like that because I don't really want to go buy several foundations when just adding a few drops of these is so much easier! Hard Candy Mix-in-Drops are available at Walmart Stores and Walmart.com.